At http://wiki.bitplan.com/index.php/Sprinkler#Requirements I am gathering requirements for a sprinkler software that I intend to create and make available as open source. The hardware is already in place - i have a garden pump connected to a sprinkler that I can switch on and off by software. I do not want to add extra sensors but would rather like to use weather information for my location (history,current and forecast) to determine the amount of water needed. My usecase is irrigating a small single zone lawn of some 100 square meter surrounded by some hedges and other plants with a tree that gives shadow most of the day. Now I'd like to create an algorithm that applies the "right" amount of water. 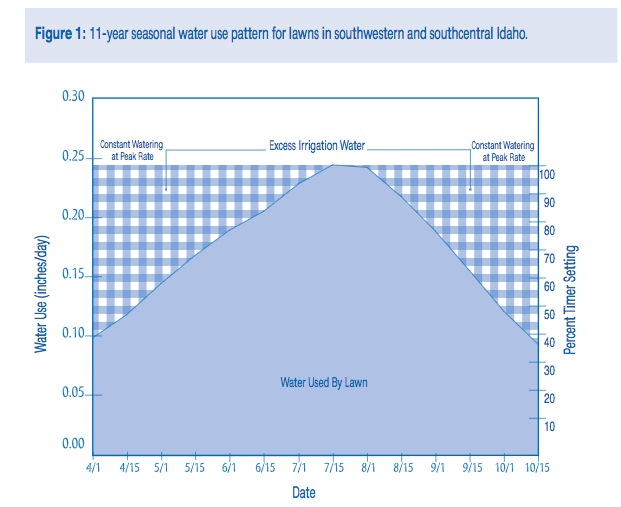 I found some sources see http://wiki.bitplan.com/index.php/Sprinkler#How_much_and_how_often.3F stating parameters like how much water the lawn needs per day. Some sources suggest to sprinkle only every 3-5 days and then a lot early in a morning e.g. the equivalent of 15 mm rain per sprinkle. Other sources say it depends on how hot it is and how much evaporation is created by the heat. I'd like to get this information more precise and hope to get some input from users here. What sources for the "watering algorithm" would you know and what do they state? The result will be an equivalent of mm/rain per hour. You might want to make sure that the sprinkler performance is uniform over the whole area of your lawn. To check this you might want to repeat the above test at the corners and the center of your lawn and compare the five results. 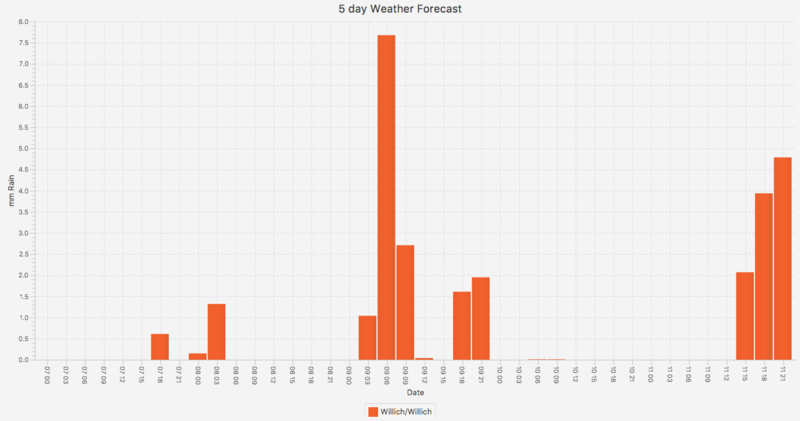 The result will be that you know how many mm of rain you got in the past few days and how many mm are expected in the upcoming days. Sand/Silt or Clay? This will let you know how much water your soil will likely soak/evaporate per day. The useable amount of water may be e.g. 5 times higher for Silt and Clay than for very sandy soil. If there is an answer to this question, it might lie in a formal statement of the problem. You want to maintain a state by making adjustments. In its simplest form you could say w = f(X) where water requirement can be calculated based on the parameters in X. The question then becomes what are the components of X and what is the nature of the function f()? You could say the system is like keeping a leaky tank of water within a certain range of fullness. The tank leaks in various ways, and if open to the air will receive rain inputs. 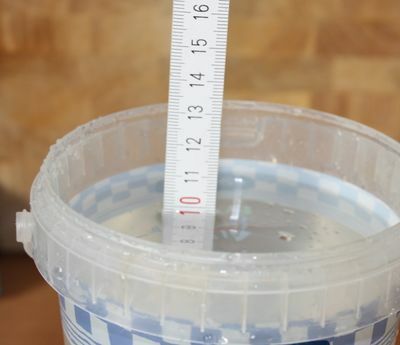 Whether you add water depends on measuring the level of water in the tank. Leaks could be the humidity of the air, the temperature, wind flow, sharpness of growing medium drainage, intensity of direct sunlight, rate of metabolism and so on. These factors cause the plant to open or close the leaf stomata, that is control the rate at which moisture is lost and in addition the soil surface and even the pot surface can accelerate moisture loss. X can also contain inputs such as rain, irrigation and even guttation when the plant weeps moisture from leaves to the soil. which says maximize the growth (or benefit to the plant) by reacting to the factors in X while keeping in mind the constraints in Y. In the tank example the equivalent might be allowing the tank level to fall to a minimum level and only then restoring to the maximum. Defining what is in f,X,Y will be the task. But we live in a world of the Internet of Things, with sensors available to measure lots of inputs and simple computers to process them. You could quite quickly establish a system to relax your mind while on vacation for a few weeks but it is likely that you will be tweaking the system with adult supervision for a long time. Collect data as you experiment and you will build a resource from which to train a neural network. This is a humongous task. I understand what you are trying to do. Along with basic education this might be a great avenue to pursue. Part of my services in Landscape Maintenance was to set the automatic timers and teach the owners how they worked. A maintenance company that understands plants and their needs, and has seen your location, might be able to help you with automation. I don't think a single algorithm will ever work with a multitude of plants, so my 2 cents at this point is to not make watering automatic until you know your plants, soil and landscape. The plants you choose and how you group them all have an effect on watering. Once you choose them and understand that, then irrigation timers will be more efficient and still be able to train plant's roots. A maintenance company that understands plants and their needs, and has seen your location, might be able to help you with automation. The optimum settings take into account how deep the water penetrates in the soil depending on the type of soil and slope! Most plants need just 1 inch of water per week but you have to train the roots to be able to thrive on that amount of water. There is a difference between lawn grasses and established ornamental plants/shrubs and don't forget new plants, plants that need lots of water and lots of drainage before they become established. Lawns need to be trained (cool season grass lawns) to have deep root systems. 1 inch per week means those cool season grasses have had their roots trained to be deep and very large as those root systems have been genetically programmed. Then those grasses are easily able to out compete weeds, drought will not deter a green lush lawn. I am very passionate about getting owners involved in their landscapes. I think they need to get out of doors and connecting to their gardens, the soil, the insects. I also think programming automatic irrigation is done visually, daily, monitoring your plants, and that we are also responsible for training roots to grow deeply thus drought tolerant. I don't think there's a way to automatize, and I don't think it would be beneficial, so I don't have a specific algorithm for you. I hope my general information about watering is helpful. Not the answer you're looking for? Browse other questions tagged irrigation sprinkler-system or ask your own question. How do I figure out where the dead-end is in a sprinkler system? How can I find sprinkler valves buried in my yard?